Welcome to the North Macon Holiday Inn Hotel The Holiday Inn Macon North, Macon, GA's newest and finest hotel is the ideal place for business and leisure guests visiting this historic Southern city. Guests will enjoy our hotel's convenient location just off I-75 and proximity to businesses and attractions in Macon. Lodging at our smoke free Macon, GA hotel means families can easily visit the many attractions nearby. The Georgia Sports Hall of Fame, the Hay House "Palace of the South" and the Ocmulgee National Monument are all less than 10 miles away. Travelers appreciate the convenient location of our Macon accommodations. We offer easy access to the Macon Regional Airport, Downtown Macon, Mercer University, Macon State College, Wesleyan College, Central Georgia Tech, and University of Phoenix. There's also a 24-hour business center and free high-speed and wireless Internet access for any business needs. 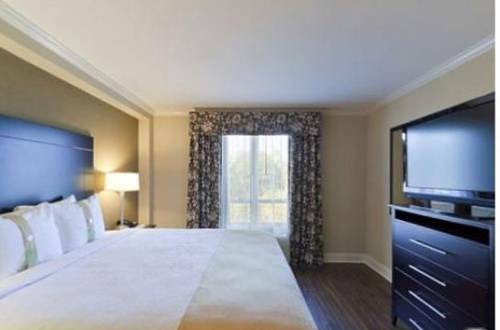 Our Macon lodging offers comfortable rooms and upscale amenities. The expanded, 24-hour fitness center has a 40-inch LCD TV to keep workouts fun. The kids will love the heated, indoor saltwater pool, and you can enjoy a cocktail or casual dining at Kem's, our full-service restaurant which offers dinner and our hot breakfast buffet for $7.99 where kids 12 and under eat for $4.99! Book your reservations today at the newest addition to Macon. Kem's Restaurant and Lounge: Restaurant hours from Monday through Friday: Breakfast is at 6am until 9am, Saturday and Sunday 7am until 10am. Dinner hours are Monday through Friday 4:30pm until 10pm, Saturday and Sunday 5pm until 8pm. Kem's: Relax with a delightful cocktail or your beverage of choice. The contemporary decor will encourage you to sit back and enjoy the moment with friends and co-workers. Enjoy happy hour between 5 and 6 pm. Ballroom: Ballroom is 2,500 Square Feet. The Grand Opera HouseThe Grand Opera House is the current location of Off Broadway productions that come through the city every year. It also hosts local events, plays and musicals. To experience a show in the Grand Opera House is like taking you to Broadway for two hours.